Do you have an extra bike at home you would like to give away? Look no further than Pedals for Peace. They gift bikes to communities in need after they have used them at the annual Burning Man regional event in Tankwa, AfrikaBurn. We happen to have 15 brand new bikes that have been used for a week at AfrikaBurn that we have been given to us by some of the international burners. The bikes have been designed to be simple and easy to maintain. 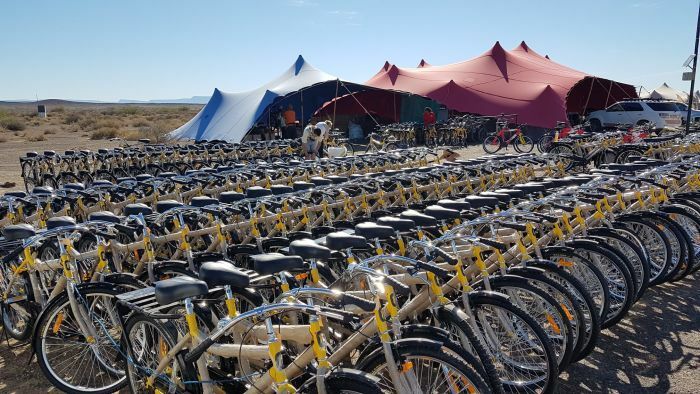 They have distributed over 700 new bikes to learners and farmworkers in the Tankwa area after AfrikaBurn.